Veggies quickly cooked crisp-tender perfection are tossed with dressing and cheese to make a colorful dish that's as easy as it is tasty. Add broccoli, cauliflower and beans to boiling water in large saucepan. Cook 3 to 5 min. or just until vegetables are crisp-tender. (Do not overcook.) Drain. Immediately rinse with very cold water; drain again. Place vegetable mixture in large serving bowl. Add peppers; mix lightly. Cover. Refrigerate several hours or until chilled. Add dressing and cheese just before serving; toss to coat. For a change of pace, serve hot. Cook vegetables as directed; drain. Add remaining ingredients; mix lightly. Serve immediately. 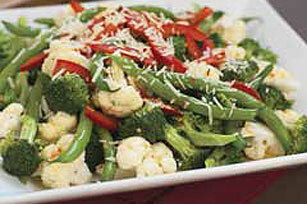 Prepare as directed, using KRAFT Sun Dried Tomato Vinaigrette Dressing and KRAFT Grated Parmesan Cheese.